Lake Fontana is surrounded by pure wilderness, with the Great Smoky Mountain National Park on the north shore and the Nantahala National Forest to the south. The 29-mile long, 11,700-acre Tennessee Valley Authority (TVA) lake has more than 240 miles of shoreline. And its deep, cold waters provide the ideal habitat for a variety of fish. 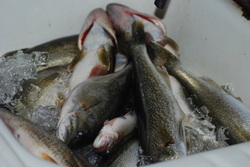 In fact, record size muskie and walleye have been pulled from its depths. Fontana Lake is nationally known for its small mouth bass fishing. Fontana Lake is unique in many ways. Unlike most lakes in the area, shoreline development has been kept to a minimum. More than 90 percent of the land around the Lake is owned by either the National Park Service or the US Forest Service. Fontana Lake provides a number of recreational diversions including fishing, boating and water skiing. And the scenery from the lake is unmatched. Those fortunate enough to go boating on Fontana Lake have a unique perspective of the Great Smoky Mountains National Park. At places the view is unobstructed from the lake level to the top of towering Clingman's Dome, the Park's highest peak. Fontana Lake's mountain-protected water is very smooth with summer temperatures in the mid 80's, which brings people from all over the Southeast to water ski and ride jet skis. We've got fish eating out of our hands around here!